Imagine a concept, that if Newton's dedication to the Emerald Tablet instead followed a different path outside the realm of alchemy and delved more into spirituality and its relationship between mankind and the world around us. As many scholars throughout the ages, Newton became obsessed with an idea that any element could be transmuted into any other element at the hands of alchemy, but the philosopher's stone quickly turned itself into a fantasy goose chase after discovering the shear level of complexity involved; Could a man ever possess the power Midas created in a chemistry lab? 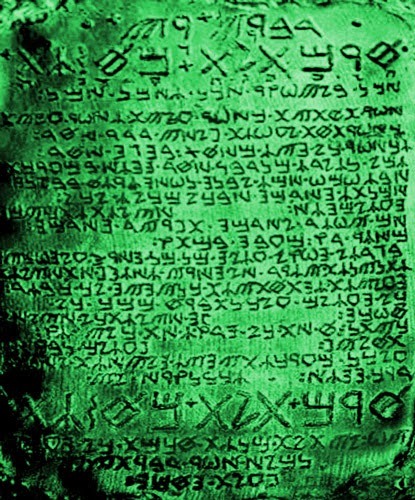 The following is a literal interpretation of the Emerald Tablet of Hermes, and an alternative possibility of what his mysterious ancient text could be trying to tell us. Truly without deceit, certain, and most veritable. And that which is above corresponds to that which is below. Purity. Either in the sense of a pure element, or for a soul to reach enlightenment, to be accepted into the heavens, and into an afterlife free from evil. As a herald, Hermes guided souls of the dead to the underworld and was also believed to bring dreams to mortals at night. It is possible these lines refer to a relationship of souls between the living and the dead. Those in the underworld were once above, and those above will in time be in the underworld. Perhaps here is where Newton first noticed clues the Emerald tablet could be a secret reference, leading eventually to the conclusion of a hidden alchemical practice used to create the philosopher's stone. Literally the verse says everything comes from one and by means of transformation, but it's the line regarding meditation of one mind suggesting a more spiritual significance. Its father is the sun; Its mother is the moon. It is origin of all. Its inherent strength is perfected if it is turned into Earth. In this verse a single statement jumps out, whereby the wind carries the origin of all in its belly. We know winds on Earth are capable of moving many different things, both living and inert, but the next line helps narrow it down by saying the Earth nurses it. If transportation of Earth is ruled out from the wind's belly, that leaves the possibility of either water, micro-organisms, electricity, or a type of radiation. Even to say, the Earth nurses it, may infer Earth's ability to absorb water. To early alchemists, in continuing along an alchemical sense, the first two lines translate as: Its father is gold, its mother is silver. Reading these lines from the tablet seems to point toward water being a key substance here. Earth and Heaven are indeed separate, and when looked at as a whole of the planet, water may also be a grossly overlooked subtlety vitally important to life as we know it. Water rises to the heavens in the form of evaporation and then falls back to Earth in the form of rain or snow. For either to occur, water molecules need to adhere to dust particles and micro organisms in the atmosphere, and it is at this point where water combines the power of both above and below. In an alchemical sense, one might interpret the Earth should now be physically separated from heaven, allowing the Earth to ascend and descend to obtain its properties. Herein have I completely explained the operation of the sun. Now it's to say, that by completing the tablet steps as an alchemy process we may find the ultimate knowledge, the answer to everything and how it's derived from one source, explaining how the universe was created. This is further bolstered by the suggestion of many wondrous applications, the discovery of a distinct pattern, and worded as an operation of gold. Yet, in a spiritual sense we find a similar outcome that in the deepest understanding of all things may we become clairvoyant and one with universal knowledge; Suggesting everything we know, and our souls, are entirely the byproduct of conscious mind and its source of light.